Osage City Golf Course board members welcomed Chamber members for an “After Hours” in April; from left, Dave Wiley, Gordon Worthing, Kim Bergquist, Clint Silver, Richard Burkdoll, and Matt Harmon. Chamber photo. The Chamber of Commerce “After Hours” is a quarterly networking event held for Chamber members and guests. Attendees have the opportunity to become acquainted with the businesses and patrons in the community. The Osage City Municipal Golf Course hosted an After Hours Mixer on April 27, 2018. Approximately 20 attended the event. Everyone enjoyed delicious snacks and beverages and good conversation. The course is in great shape and the golf board members would like to encourage everyone to come out and enjoy a game of golf. Available are a variety of memberships to join which include single, family and student. The spacious club house is also available to rent for meetings, parties and receptions. Sunday morning breakfast is also served during selected months throughout the year. Many tournaments are hosted throughout the year at the course. Scheduled plans for future “After Hours” will be ECAT in July, Peterson’s Assisted Living in September, and Ramblin’ Rose in December. Chamber scholarship recipients, Georgia Hutton and Carter Swindale. The revenue from the $5 that residents pay to be listed on the maps for the spring and fall garage sales goes directly for these two scholarships. The Osage City Chamber of Commerce was pleased to announce Georgia Hutton and Carter Swindale as the 2018 recipients of the $250 scholarships. Georgia, daughter of Troy and Kerri Hutton, will be attending Full Sail University, in Florida. Georgia is enrolled in the Bachelor of Music Business. After her graduation, she hopes to obtain a job in the music industry and be a positive role model for girls and young musicians. Georgia’s end goal is to own her own production company and start a music label that promotes a positive image of music. Carter, son of Kevin and J.J. Swindale and Tricia Gundy, will be attending Emporia State University in the fall. Carter will be part of the men’s track and field team as a thrower. He plans to get his degree in biology and pre-physical therapy. He will then apply to a doctorate program to get his degree as a physical therapist. Carter eventually wants to come back to Osage City and work in their family practice. The Chamber would like to wish Georgia and Carter the best of luck as they embark on the next chapter of furthering their education. The Osage City Chamber of Commerce would like to congratulate the graduating class of 2018. Best wishes to each of you in continuing your future endeavors of college, technical school, employment, or where ever your interests may lead you. As of June 1, 2018, the Osage City Kiwanis will no longer pick up papers, magazines and shredded paper in Osage City on the last Saturday of each month. However, the club will continue its paper recycling program. With the advent of the city’s recycling program, the club has had two collection bins as part of that program. It has been decided to concentrate the club’s efforts on the recycle bins located at the city’s maintenance yard at Ninth and Main. The bins are available seven days a week, 24 hours a day. Miscellaneous papers, magazine and shredded paper in a plastic bag remain the same acceptable paper items. The Kiwanis encourage you to use this method of paper recycling. An Osage City Kiwanis sign is on the maintenance yard fence identifying their recycling program. The two bins are marked papers and newspapers and are located immediately behind the sign. Some older patrons may find it difficult to come to the bins. For reasons of age, health or inability to get to the recycle bins, anyone can contact the Kiwanis at 785-528-2891 or 785-217-4586 whenever paper pickup is needed. In the near future, the fairgrounds, Lions Club food stand, 4-H barns and pavilion, parade route will be bustling with a lot of activity going on. 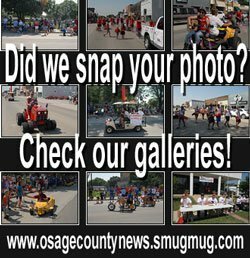 June 27-30, 2018, are the dates for the annual county fair in Osage City. Diane Michael is in charge of the parade which will be held at 6:30 p.m. June 28. he is hoping to make it a fun filled event this year. Diane reported that she is starting to receive entries; however, she hopes that there will be many more to come. Decorated golf carts and ATVs are invited to participant in the parade this year. Golf cart and ATV drivers must be at least 17 years of age to drive in the parade. 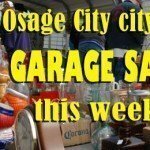 Detailed parade information including prize money for floats, golf carts and ATVs may be found on the Chamber of Commerce website at www.osagecitychamber.com. This year, a coloring contest for ages kindergarten through fifth grade (2018-19 school year) will be sponsored by the Chamber of Commerce. Students participating in the summer reading program at the Osage City Public Library can pick up the specific coloring page and return by noon June 18. Eight winners will have the opportunity to ride on the fire truck in the parade. Be sure to mark your calendar for the Osage City annual community fireworks spectacular which will be held on July 1, 2018. Plans are coming together to include an exciting day of activities for the families to enjoy. There will be lots of free activities leading up to the fireworks display, including a youth fishing tournament, community choir concert, bounce play sets, carnival games, watermelon feed, and live band “The Tweed Tones”. Other activities include community worship service, disc golf tournament, bingo, balloon artist, food and snacks, pie and ice cream social. Moe and Donita Payne’s yard of the month is at 633 Main St., Osage City. With all of the beautifully groomed yards and flower beds in Osage City, the Osage City Chamber of Commerce is sponsoring a “Yard of the Month” recognition during the months of June through September. The selection of the yard will take place during the first few days of each month. In appreciation of the beauty and hard work for the selected yard, the home owners will receive a $25 Osage City Chamber Buck Certificate to be used at any Osage City business. We are pleased to announce that Moe and Donita Payne’s yard has been selected for the month of June. 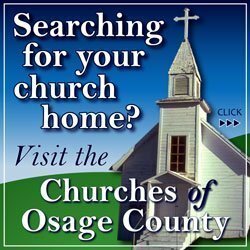 Their home is located at 633 Main St., Osage City.